Here in a single volume is one of the most authoritative, thoroughly documented accounts of the U.S. Navy’s war against Japan. 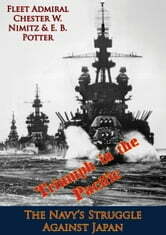 This is the story of the achievements, defeats, and victories of both the American and the Japanese navies as they met and battled in the greatest naval war of all time. This dramatic narrative brings to life both the glorious and the infamous—the decisive encounters at Midway...Guadalcanal...the Philippine Sea...Leyte Gulf...Iwo Jima...Okinawa...and the other points in the Pacific where history was made from 1941 to 1945. The information for TRIUMPH IN THE PACIFIC was gathered by historians at the Naval Academy at Annapolis under the direction of E. B. Potter, the Academy’s Chairman of Naval History, and Fleet Admiral Chester W. Nimitz who, as Commander in Chief Pacific Fleet and Pacific Ocean Areas, was a principal figure in the conflict. The book is marked by authenticity, conciseness, objectivity, and the accuracy of years of painstaking research and preparation.